Our Sai Baba Forum is World's first and largest Sai Baba Forum on earth. It's an inspiration for all other Sai Baba Forums exist today. It's such a divine blessing to be a part of this wonderful and blessed Family of Baba Sai. And recently it was a 5th birthday of our Forum. I really apologize and bit sad too because I missed the day. I completely forgot about this Big day. So finally it's official. Happy Birthday to our DwarkaMai. Our DwarkaMai completed 5 years on march 9, 2009. Although I missed this beautiful day, but I still want to celebrate it, though in a different way. We are planning to register this Forum as a non-profit organization with Govt of India so all the initiatives and functionalities will be transparent. Here is a divine opportunity for all the Sai Devotees and an initiative for this blessed Forum. If you are really passionate about Baba Sai, spirituality, want to spread his teachings, want to interact with lots of devotees and want to spend some quality time, then this DwarkaMai opens it's doors for you. You have an opportunity to manage and work for this blessed Forum. Just share your ideas and thoughts and let us know what things/ activities you would like to do differently. What are the new initiative you want to start. What are the things you would like to do if you own/ control this Forum. If your thoughts are really good and if Baba Sai's wishes for same, I am sure you will have a chance to work on the idea/ thought. Please understand it's not an Ad campaign or a competition . It's purely about an initiative where we want to best utilize this medium (our Forum which is already very popular with his blessings [touch wood]) to reach out Sai Devotees and spread the true teachings of Baba. There are several initiatives going on. Samarpan is a beautiful example. It's the first e-magazine on Sai Baba of Shirdi. We already have a dedicated Radio (in fact two, you can change the channel as well) for Sai Devotees. So please open your heart. Happy Sai baba's Day as well as Happy 5th Anniversary of this Blessed Sai Baba Forum. Indeed Idea of Making this forum more transparent is good. Mr. Ravi may recall that earlier also I had given suggestions to make this forum more comprehensive. I would give some more suggestions in my next post. First, a hearty congratulations to you and the entire Dwarkamai family for having completed 5 years ! I have been noticing that the membership of this forum has been increasing at such a fast pace every day ... and its really exciting. And its now even more exciting to hear of your plans to take this forum to newer heights .. 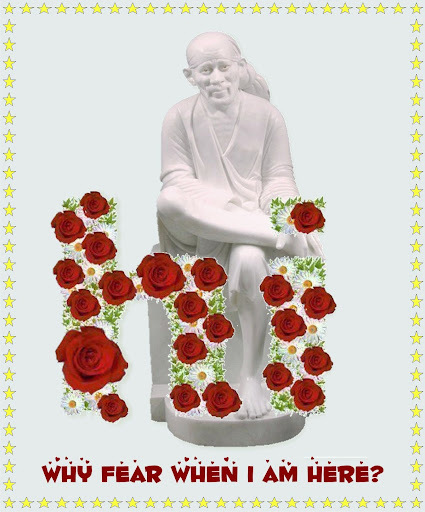 Happy birthday to our Sai DwarakaMai. I think it is all due to Sai's blessings that today April 9,2009,thursday and Hanuman Jayanthi too. Everything seem to have fall on this auspicious day. By Sainath's grace, it is a wish that our forum should keep growing and reach everyone and pray our Sai His simple teaching Shraddha and Saburi. Jai Sai Nath to all. Heartly congratulations for the 5th Anniversary of Dwarkamai forum. Ravi you are going right. Good luck to all members of this forum for their participation and suggestions. I think only giving suggestions won't work, but we need to contribute as well with initiative for taking on the responsilblity of organising different activities at different levels. Once the forum is non profit organisation with the due blessings of baba we need to propogate this forum for more and more good activities which could benefit many needy people on earth. We need to work hard to create awareness about the baba's simple living and his love for all religions, his devine stories and his thoughts, his teachings and his beliefs. Everybody on the earth needs blessings from Baba and we should work hard to bring baba to each home and each heart so that everyone is blessed with his love, affection and blessings. Thanks everyone for your posts. Please open your heart and let us know. I really missed an important thing or perhaps it wasn't clear from my initial post. we are looking for more devotees to take the responsibility as a Mod and help this DwarkaMai. I guess we can have 2 more Mods and 1-2 person for Samarpan Magazine. Please let us know if you interested and let us know what value you want to add to this DwarkaMai. dear mr.ravi, my heartiest congratulations to you for bringing "DWARKAMAI" to us for the past 5 years and thus paving the way for thousands to get sai's blessings , especially those who are not based in India. great work. my heartfelt thanks. OM SAIRAM. My heartiest congratulations to DWARKAMAI on 5th BDAY!!!!! How did I miss this post? ?? Better late than never . Baba bless our online dwarakamai always and take good care of each and every person of this sai family. Thank you Ravi bhai for bringing all of us together. It would have been not possible without you. Baba bless all. From last few months i am really upset regarding my personal problem. I never knew that thr is any site where we can get baba's blessings and so many frnds who are real devotee of shri sai baba, one day i dont know how i reached this site and just feel like coming again and again. Om Sai Ram and Congratulations for your great efforts. I just learned that it has been 5 yrs. since u started this site. I really feel blessed to be a part of it. It's a great service and great opportunity Baba has given you. You are really blessed. Thanks for the wishes. Please continue to be with our blessed Sai Baba Forum and contribute to help the people. Page created in 0.391 seconds with 63 queries.